Ordinarily I wouldn’t do this: write about a specific new defensive coordinator when there are still several important games left in the season – games in which the Ducks could significantly improve, or the new DC’s team could get blasted. But I really don’t think either of those things is going to happen. I believe I have enough evidence to present an early, but well-thought-out, speculation about the future of Oregon football. First let’s can this fire-Helfrich crap. It’s irrational to think Oregon could get a better, more-qualified head coach than Mark Helfrich. Another hire would set way back a very well-established, top-level football program/culture and offense. Not hiring a new defensive coordinator, however, would be almost as irrational. I’ve seen enough of Brady Hoke to know he’s simply not capable of sufficiently fixing Oregon’s defense. Four defensive coordinators in five years certainly isn’t ideal. But sometimes ya just gotta do what ya gotta do, no matter how painful and awkward it seems at the time – like surgery or divorce. So, who is this man I think can help make Oregon’s defense play at an elite level? He’s Osia Lewis, currently the “Senior Defensive Assistant” at Vanderbilt. Is that a quizzical look I see? I thought a lot about possible defensive coordinators – believe me, I know a lot about this subject. The guys the Ducks didn’t get last year aren’t doing real well: Jerry Azzinaro with the 49ers, Robb Smith at Arkansas, Mike Nolan now a TV analyst, Todd Orlando of Houston and a lot of other well-respected defensive coordinators are having some rough outings. Pete Kwiatkowski of Washington is having a great year, but there was no way he’d leave Chris Petersen for Oregon. Let me emphasize: There is NO invincible defensive coordinator, whose ingenious schemes can make any offense ineffective. The Huskies are great now because they have a whole bunch of great defensive football players, who’ll soon be playing in the NFL, and those players are really well-coached. Then I thought of a currently successful DC I’ve admired a lot for decades: Rocky Long, now head coach at San Diego State. I started admiring Long’s unique defensive schemes at Oregon State in the early ’90s, when I’d often attend their practices. And there was a young defensive coach at OSU then who really impressed me with his enthusiastic, knowledgeable teaching ability: Osia Lewis. The Beavs’ defense had very little talent at the time, but was very well-coached. Brady Hoke was also a defensive assistant on Rocky Long’s OSU staff until ’95. Osia Lewis got his Bachelor’s and Master’s degrees from Oregon State, where he was voted the Most Inspirational Player, as an all-Conference LB in 1985. Osia coached at his alma mater, under Long, from ’91-’96. From 1997-2002, Osia coached defensive linemen and LBs in the Big-10, at Illinois. In 2001, Illinois won the Big-10 Championship, going 10-2 and played in the Sugar Bowl. In 2003, Osia was reunited with his mentor, Rocky Long, now head coach at New Mexico. Lewis was now Long’s defensive coordinator. Immediately  the Lobos became the 5th-leading defense in the country against the run [86.1 avg]. New Mexico became known for its over-achieving defenses, going to bowls in ’03, ’04, ’06, and ’07. In 2007, New Mexico ranked 13th nationally in total defense. In 2009, Long became the DC for head coach Brady Hoke at San Diego State. After the 2010 season, mainly because of Long’s successful defenses, Hoke got the head coaching job at his alma mater, Michigan. Long then became the head coach at San Diego State. Got that? 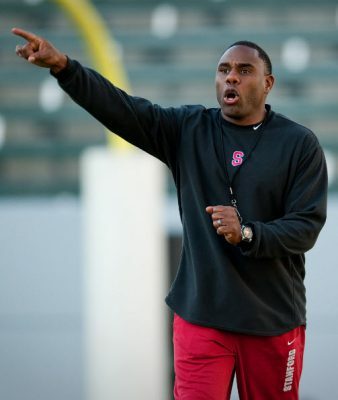 Derek Mason was defensive coordinator and guru at Stanford. So in 2011, Lewis was again reunited with his mentor, coach Long, as the defensive coordinator at SDSU, again cranking out very good defenses, without a whole lot of talent. In 2014, SDSU finished in the national top-20 in nearly every defensive category, including 13th in scoring defense and 16th in total defense. When Mike Riley left Oregon State, Lewis was asked to interview for the Oregon State head coaching job, in 2014. Staying at SDSU in 2015, they were Conference champs, while finishing nationally 5th in total defense, 7th in scoring defense, 7th in rushing defense, and 10th in pass defense with 23 interceptions. They beat Cincinnati in their bowl game, 42-7. 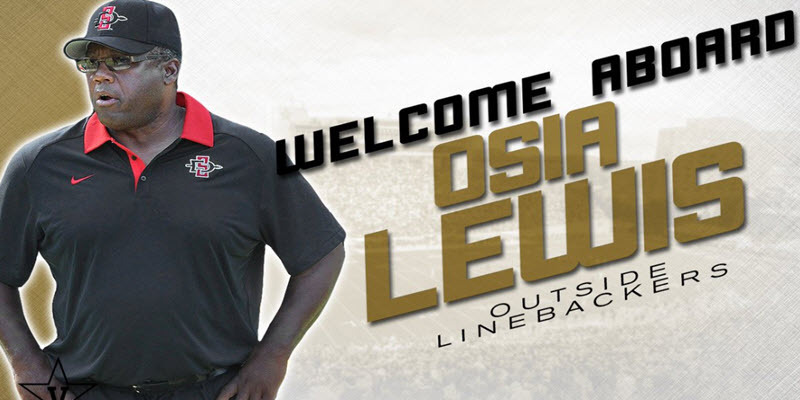 In 2016, one of the other great defensive coaches in the nation, Derek Mason, now the head coach at Vanderbilt and formerly a very successful DC at Stanford [Ducks fans should remember], offered Lewis his current “Senior Defensive Assistant” position. Mason said Lewis “was the missing piece of the puzzle. A perfect fit for Vanderbilt football.” Coach Mason is essentially the defensive signal-caller, but Lewis runs the defense when Mason is busy elsewhere – essentially the same relationship Osia had with coach Long. How’s 2016 going for Vandy? They’re “very much improved defensively.” Ranked currently 30th nationally in scoring defense [21.4 ppg], but that includes 35 points against Georgia Tech [whose offense is so unlike any other that it shouldn’t count], and 30 against high-powered, scoring-machine Western Kentucky. Playing in the SEC, they held: South Carolina to 10, Florida to 13, Kentucky to 20 and Georgia to 16. Vandy still has to play Auburn [11-5], Ole Miss, and Tennessee. I’ll now be watching those games. But I think my case has been made: Osia Lewis, now a very seasoned but still energetic 53, was mentored and given major responsibilities for 10 years by one of the top defensive coaches and defensive innovators, in the country, and currently has an important job for another great defensive coach and innovator. Osia is a very intelligent, charismatic, enthusiastic teacher and designer of defenses. Oregon can’t get a better qualified defensive coordinator than Lewis. The rest of the defensive staff? There are a couple of ways they could assign the other coaches. Lewis would coach at least some of the LBs. I’d be very surprised if Hoke wasn’t retained, especially if the new DC’s Lewis, who’s known Hoke well for 25 years. The current players and possible recruits really seem to respect Hoke, and he could be a big help in the transition. Actually Hoke “could” be a knowledgeable advocate for hiring Osia as his replacement. Despite a couple of difficult years, John Neal’s got too good a track record – and is just too good a communicator – to replace. Look at what he’s done with Brenden Schooler. Ron Aiken could comfortably retire and/or Don Pellum would be a very good recruiting coordinator if he wants. And the new DC might want to bring in at least one of his own guys. We’ll see, but I’m confident all the changes will be improvements. So come on back to Oregon, Osia Lewis, and help teach these Ducks defenders how to intelligently, quickly and aggressively out-execute their offensive opponents. Top Photo from Vanderbilt Athletic Dept.